London is busy. The roads are busy, the pavements are busy, the shops, the Underground, the buses … all busy, but that’s what we love about this city right?! So what can we do to make London easier to navigate when we have children? Slings can play a massive part in making London more accessible. Have you ever had to miss a bus because the buggy space was already full? Have you had to awkwardly carry your buggy up the stairs on the Underground? Have you found it difficult to navigate the busy shops? Have you cancelled outings because the journey seemed just too difficult with a buggy? A sling could be the answer! We can provide advice from experience, all of us are London based sling users! We can offer sling rental in north London. If you normally drive but find a need to use public transport for any reason, we can provide short or long term sling rental to avoid the hassle and financial burden of having to buy your own sling. Mum to L, Girl aged 3.5 years & H, boy aged 3 months. I used a sling with my daughter from about 4 months after encouragement from a friend who ran the local sling meet. I liked using it especially on public transport with limited accessibility for buggies and in cold winter weather when I couldn’t push our buggy through the snow (we lived in Glasgow at the time). As my daughter grew I continued to carry her as we both enjoyed the closeness and the flexibility it offered. Since moving to London our sling use has only increased, I have used slings with my new baby from the beginning and found them indispensable. For my daughter, now 3.5yrs, it has been a really useful way as she has grown to allow her the independence to walk when she wants and be carried when she is tired without the inconvenience of dragging a buggy around with us. Using slings regularly has been a tool we have used for promoting a close bond between us. I have used slings with my son from birth, he takes all his naps in the sling and it means I have my hands free to play with my daughter. He is rarely fussy and everyone comments on what a calm baby he is. When I was commuting to work in central London my daughter was in nursery near to my work, and the sling made the joint commute possible and wonderfully snuggly too – there was no way we could have taken the buggy on the tube during rush hour and I am certain the journey would have been more stressful without the sling. 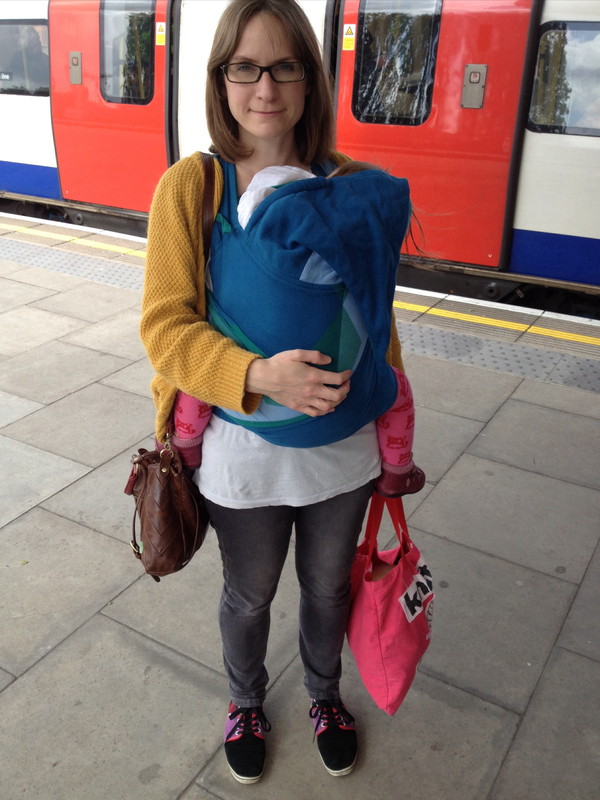 What one piece of wisdom would you pass onto other parents in London who may be considering using slings? Don’t be put off by the vast range of slings on offer – there is plenty of help to find which is the right carrier for you. Go to a sling meet and make use of your local sling library to borrow and try out different types of sling. Purchasing a sling second hand is easy and affordable, and slings have great resale value too. Oh, and don’t just default to buying a Baby Bjorn as there are so many nicer slings available that are way more comfy on your back and for your baby too. Mum to L aged 6 months & E aged 4.5 years. 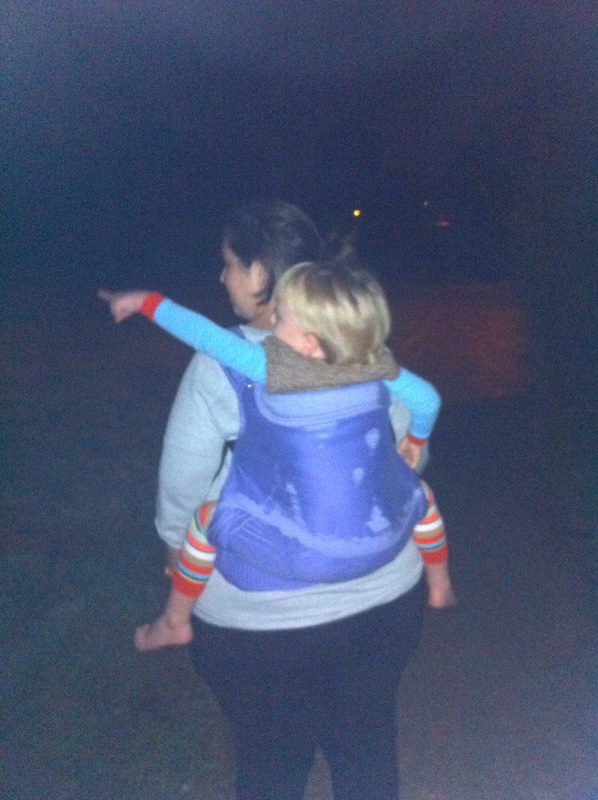 I started using slings (a Moby stretchy wrap) in April 2009 when my first son was born. I wanted to be able to keep him close when out and about and when in the house. However, when he became to big for the Moby I didn’t get on with the mei tai I had and didn’t use it very much. We then bought a soft structured carrier (SSC) that was used a lot for days out and overseas travel by both me and my husband until my son wanted to walk everywhere. 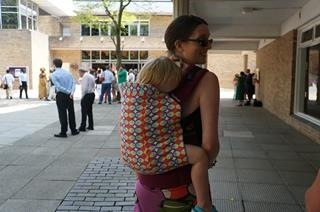 I have used slings even more with my second child, moving from the Moby to woven wraps and a SSC. On a daily basis I can keep him close and comforted and I have my hands free to manage my older son. I am learning to back carry with a wrap which means I can get on with daily tasks and my son is happy and relaxed in the wrap when he needs to be held rather than being left in a rocker / on a playmat. I have been able to keep both my children close to me and maintain nurturing touch during their babyhood without being stuck on the couch! This has supported our breastfeeding relationships – to term with my older son who self weaned and so far to 6 months with my younger son. Slings have helped me comfort and settle both children when they are unwell, tired or teething. We are able to go out and easily access all sorts of places that would be difficult with a pushchair: the London Underground, the Eiffel Tower, boats, woodland walks and places with lots of stairs such as museums and galleries. Now I can have both hands free to manage my older son and can do things like push him in a swing at the park, hold his hand while walking down the street and give him a hug when collecting him from school, all while keeping his little brother close and included. I believe slings have played an important role in both my children being well attached, confident and happy. We recently travelled from London to Australia to visit family with a 4 month old and 4 year old. Due to unexpected events, at one point I had to travel from Sydney to Melbourne on my own with both children and 2 suitcases plus nappy bag and other hand luggage. Getting from the Sydney airport carpark to the terminal, through check-in and security and onto the flight, off the flight at the other end, through baggage claim and the terminal to the coach station and onto the coach into the city centre in Melbourne would simply not have been possible without a sling! Visit a sling library or sling meet so you can meet other people who use slings and you can be shown first hand how to use a range of slings and carriers and helped to find the one (or ones!) that are right for you and you little one. I believe they know they will be responded to, they’ve seen the world from my eye level which means people have always talked to them rather than being ignored in a buggy. They’re able to learn to read your facial expressions and learn language easily as you talk to them in the sling and they can see how your mouth forms sounds etc. I sling my son in the afternoon when collecting my daughter from nursery which means we’re easily able to negotiate a difficult and always busy bus route. I did try it once with a buggy and it took nearly 2 hours to get home – it’s usually a 20 minute journey! You Tube videos are okay for looking at how to wrap but getting professional help makes a real difference in knowing how best to carry your baby and which type of sling to choose! Mum to Albert, 4 years 6 months and Florence, 2 years. When did you start using slings & why?While pregnant with Albert I liked the idea of using a sling, did some research and bought a Moby stretchy wrap online but could not get to grips with it when he was born and did not know where to go for help. I also bought a Connecta online and used that a bit when he was a few months old but did not find it very comfortable. We later got an Ergo and used that quite a bit until he was about 18 months old, but overall I primarily used a pram and buggy for him. When I got pregnant with Florence I didn’t want to use a double buggy (and we did not have room for one anyway) and really wanted to use slings instead. There seemed to be much more of a sling community around this time and I arranged for a sling consultation when I was around five months pregnant. I can’t remember how I found about the consultant (Becky Derham) but she was great. I learnt how to use the Moby and mei tais and later bought one of the latter from her. When Florence was born I used the Moby all the time; there were days she only came out for feeds and nappy changes! She hated being in the buggy and was worn pretty much exclusively for about ten months, first in a Babyhawk mei tai and then in a Hop Tye. I loved the idea of using woven wraps but could never really get my head round them so wrap conversions are my happy compromise – I’ve since had two made and bought one or two more! Albert had quite bad reflux and I really really wish I had used slings with him more as it would have greatly reduced his discomfort, stopped him screaming like a banshee in the buggy and generally made my life a lot easier and less stressful. Florence had reflux too but got through it much quicker and I’m convinced that is at least partly because she was worn so much. Wearing her meant I could be hands free for dealing with a toddler who was only two years and four months when his little sister was born. I could run after him without having to push a buggy at the same time and did not have to try and negotiate a double buggy all over the place. I wore her while bathing him, changing nappies…I think it also helped reduce jealousy or sibling rivalry as Florence being in the sling meant she (initially) took up a lot less of Albert’s space. Blimey, there have been so many. A recent one though – Albert started school in September and was half days for weeks. This really messed with Florence’s nap times; she was getting desperately over tired and I was getting very stressed. Getting her to fall asleep in the sling helped her nap and stopped me from having to try and rock a two year old to sleep. Try before you buy – visiting a sling library and/or getting a consultation can save you from making expensive mistakes! Mum to Bertie, 3 years. I started using a sling when Bertie was 48 hours old. We lived in a flat, he hated lying down (it materialises he had reflux) and I loved holding him. We’ve been to places and done things we simply couldn’t have/or would have been made more difficult with a buggy and without a sling. 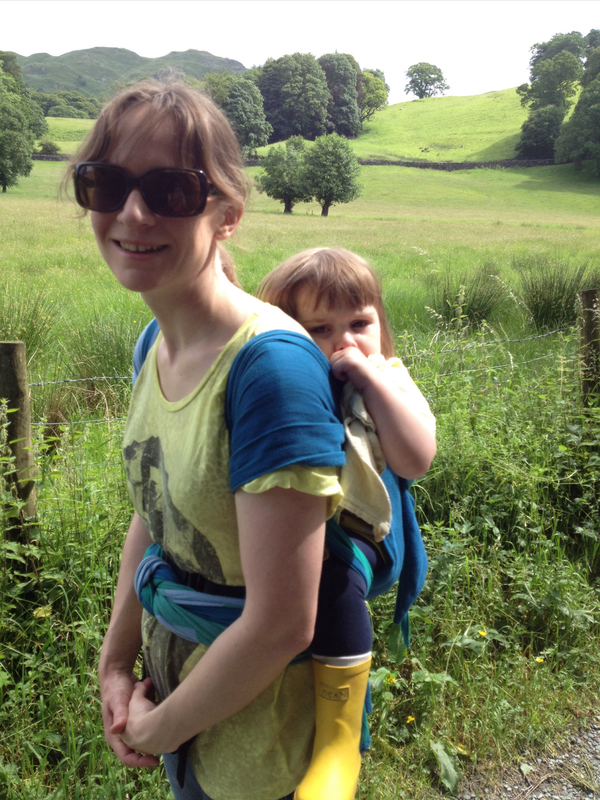 Walking up hills/mountains, through woods, holidays – we just holidayed in Umbria up the side of a mountain, our slings were invaluable. In the early days the sling was amazing for bonding for both myself and Bertie’s Dad. Using public transport in London. Buses, tubes, trains are all horrendous to use with a buggy. In the area I live in there are no lifts so escalators and steps are everywhere. Skipping down those with a child on your back is brilliant! Slinging a 3 year old doesn’t need to happen all the time but having a sling rolled up in your bag for when said child gets tired, overwhelmed, facing rush hour on the tube is brilliant. The sling weighs nothing, you can grab it out of your bag when needed and roll it up and put in your bag when finished with. If slinging a 3 year old in wet/cold weather take an extra pair of thick socks and a plastic bag for wet shoes. Too many times I’ve had mud wiped down my clothes from shoes. Mum to C aged 5 years & S aged 3 years. I started using a Baby Bjorn when C was tiny; we lived in London and I had no desire to be pushing a buggy down busy pavements, up stairs at the train station, or on the crowded buses. It wasn’t particularly comfortable though, and a friend offered to sell me her Babyhawk MT when C was about 6 months old. Then I discovered online sling resources and never looked back! I now have slings in various sizes, for various uses – they’re rather like shoes or handbags in that respect. They’ve become an integral part of our day to day life. In the early days slings they meant that my husband and I could navigate London easily. They gave me my hands free to deal with my active little boy when my daughter was born. They’ve meant one less piece of luggage on holidays (no buggy needed). They’re so much easier than a piggy back, even if people think it’s odd to have a 5 year old supported on your back! There’s always a sling in my bag, or in my car – even 5 and 3 year old legs get tired, and a buggy is impossible to carry around ‘just in case’. The one time I could never have managed without a sling, was when my daughter was born. It gave me both hands free for playing with my toddler; and I learned to nurse my daughter in it, which meant that I didn’t have to stop and sit down (if I didn’t want to) – important given that my son was never a fan of staying still for long! Find a sling library, check out Natural Mamas online, and avoid buying anything from the high street stores until you’ve had a play with different carriers. What suits one person will not necessarily suit another – slings are a very personal thing. But be warned, it can become an addictive hobby!